Victoria state police confirmed that the deceased was the 58-year-old resident of the house but did not identify him by name, in keeping with local practice. Ham was 58 and neighbours said he was the lone occupant of the house. 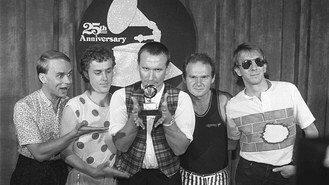 Ham was perhaps best known for playing the famous flute riff in the band's smash 1980s hit Down Under. But the tune came under intense scrutiny in recent years after the band was accused of stealing the catchy riff from the children's campfire song Kookaburra Sits In The Old Gum Tree. The publisher of Kookaburra sued Men At Work, and in 2010 a judge ruled the band had copied the melody. The group was ordered to hand over a portion of its royalties. "It has destroyed so much of my song," he told Melbourne's The Age newspaper after the court ruling. "It will be the way the song is remembered, and I hate that. I'm terribly disappointed that that's the way I'm going to be remembered - for copying something."